Does he want to be "just like daddy?" This adorable frame for dad from his little guy features a sweet sentiment and space for 4x6 photograph. 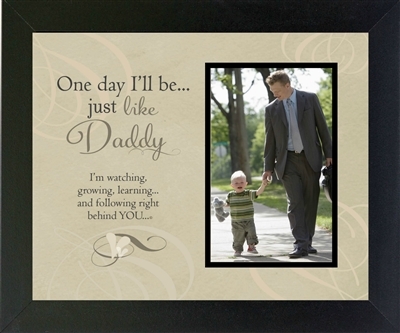 Masculine, yet touching, this 8x10 wall or table frame will be at home in his home or office. Available in black, white or walnut, this frame will make his little boy shine, whether he is 3 months or 3 years. A perfect Dad gift for Father's Day, baby shower gift for a new dad or other special occasion that celebrates the best dad ever!